Timberly Woodturning has become the New Zealand agent for the Modern Longworth Chuck. This sale is for the 12 inch. all come with 8 buttons. 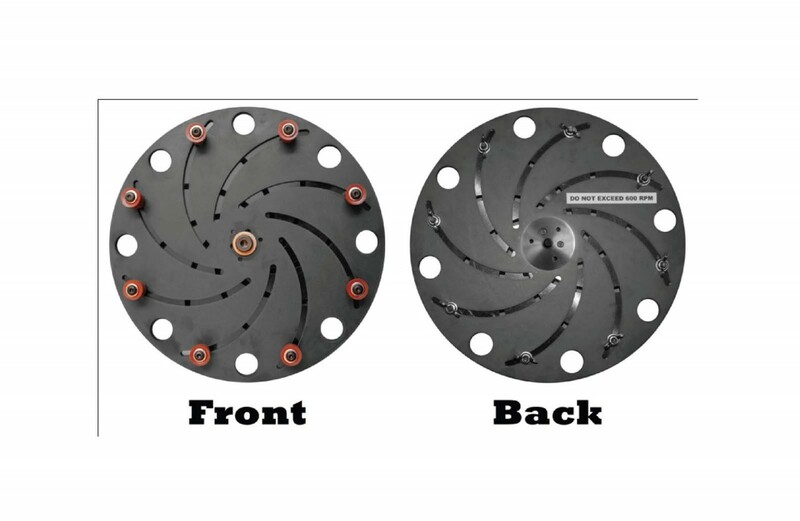 The 20" and 24" chuck will come with 16 buttons due to the very large size, using our 8+8 system. For gripping smaller sized pieces on the bigger chucks, you may simply remove 8 buttons to access the smaller half of the clamping range. The capacity of the chuck for external gripping, compression is approximately 2" smaller than the stated size of the disk due to the buttons. Internal expansion will be close to the stated size of the disk. All units are produced using top grade black ¼” phenolic plates CNC cut for premium performance and reliability. Chuck interface plates are produced from high carbon tool steel and the precision axle system can be disassembled to facilitate exchanging interface plates based on the desired jaw size being used. Units include an interface plate for #2 jaw sets unless otherwise noted. A standard 4-jaw scrolling chuck or equivalent is required for use with this system. Buttons are made using virgin silicone resins and soft enough to insure a firm grip while being non-marking. Buttons do not contain any oils which are known to be imparted to the material being held. The modern longworth chuck is manufactured in the USA. Those interested in a Longworth Chuck for their lathe would usually have to find a set of plans and try to build their own from scratch. Now you can get this high-quality, ready to use, Longworth Chuck fashioned from durable phenolic resin. The accurate CNC machining of this chuck ensures the phenolic disc plates rotate smoothly for adjusting the clamping diameter of the chuck. The compressible silicon rubber buttons are non-marring and won’t leave any scuff marks on your lathe turnings. A quick twist of the wing nuts locks the plates together and compresses the rubber buttons to finalize the grip on your work piece. The Longworth Chuck has a steel mounting plate measuring 2-1/4”x 3/8” thick. This lets you use your existing 4-jaw scroll chuck, w/ #2 jaws for gripping the mounting plate, holding the Longworth Chuck to the lathe. This eliminates the need to change chucks or to switch out jaws and/or move buttons. Click the button below to add the Modern Longworth Chuck (woodturning chuck) 12 inch 300mm to your wish list.